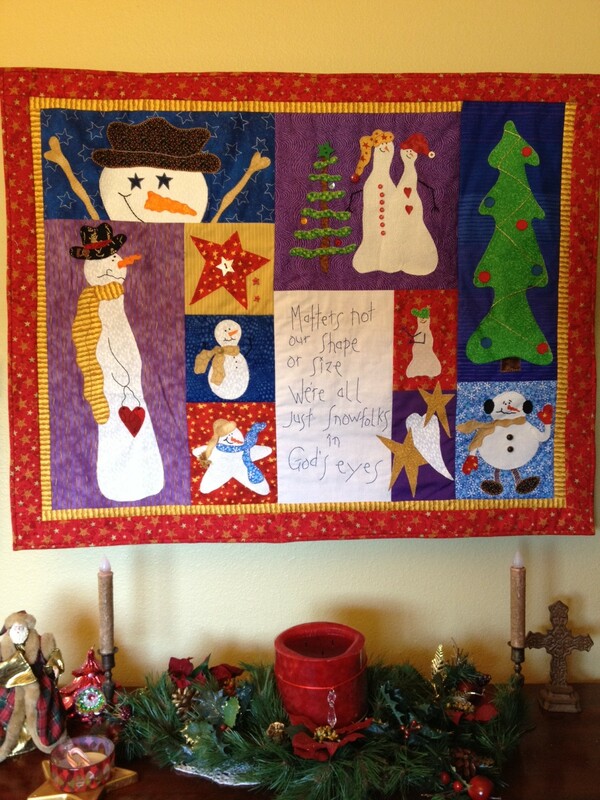 Yeah, I finally finished my 2011 Christmas Wall Quilt of snowman friends of all shapes and sizes. I started this one four months, and I actually wanted to start probably four years ago but I kept doing other projects instead. So finally I got my act together in September and was determined to have it up for Christmas. Yes, I know I’m a tad bit late, but technically I still have all my Christmas decorations up for another few days, so technically, the snowman people made it in time. It took me a long time to do each snowman because it’s all handstitched along all the borders. I still have quilting to do on it; I’ll keep you posted on that one. That has to wait until it comes down off the wall. Happy New Year ya’ll!!! I love it, Kay! You are indeed an artist!! Thank you Edie. You are so encouraging. Love you. Kay – the quilt is beautiful! And look at you with your new snazzy blog. I love it! I love the layout and it is so artistic and welcoming. Happy New Year! Thank you Arlene. You are my inspiration to do a blog. Happy New Year. Love all the beautiful quilts you make. Your labor of love makes many people happy! Kay Keep up the good work! Luv Ya Girlfriend! !